Ship Weight : 21.5 lbs. in the last 2 years. Monin Organic Syrups use organic cane juice, made with the traditional method of evaporation and with the help of mechanical methods only. Contains only the finest natural and organic flavorings available. Monin Organic Syrups are GMO free, Gluten Free, Kosher, and Vegan. USDA Certified Organic. One case = six 750ml glass bottles. PREPARATION: Using a Monin syrup pump, you can dispense a perfect 1/4 fluid ounce shot of syrup every time and mix beverages consistently. 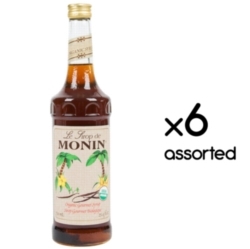 Serving sizes on Monin Classic syrup bottles are for one fluid ounce, or four pumps. Click here for the right pump lid. $0.39 / oz. $0.37 / oz. $0.35 / oz. $0.31 / oz. Monin Organic Syrups are made with organic evaporated cane juice and the finest natural and organic flavorings available. Monin Organic Syrups are GMO free, Gluten Free, Kosher, and Vegan. USDA Certified Organic. One case = six 750ml glass bottles. This pour spout snaps into place on the 750ml Monin syrup bottles. This spout remains in place and replaces the cap. This pump snaps into place on the 750ml Monin syrup bottles. Simply press down to dispense one � oz "shot" of syrup into your drink. This pump remains in place and replaces the cap. Please note: There are two parts to the syrup pump, the pump head and the long tube. Parts may separate in shipping.